I drink a lot of soda, some of it from aluminum cans. I recycle when it's reasonably possible. And I like getting building materials for my garden railroad free. 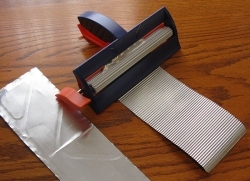 So I am indebted to George Shreyer's excellent description of how to use aluminum cans and a Fiskars paper crimper to create free corrugated aluminum panels to build with. Unfortunately, I seldom have enough time to cut up the cans or to roast them in the oven (it makes them less shiny and easier to crimp). Fortunately I've found an easy-to-use substitute. 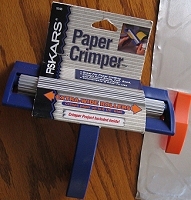 The Fiskars "paper crimper" is available at Michaels for about $18, cheaper if you get a 40% or 50% off coupon in your Sunday paper. 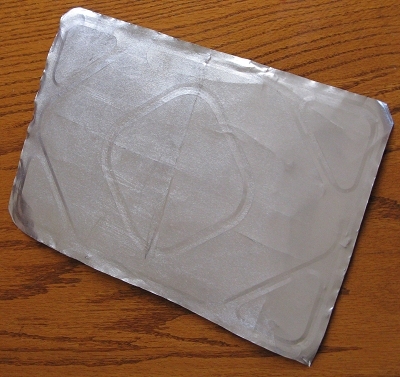 Its plastic and aluminum construction isn't real solid, but it will crimp thin aluminum sheeting. 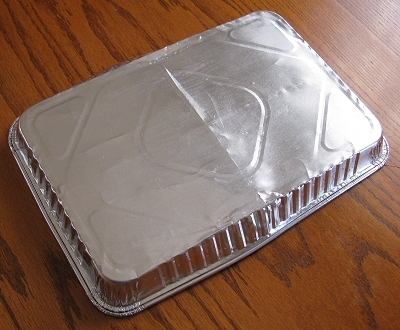 In 2008, due to graduation open houses and the like, we have aquired several of those disposable aluminum containers that you get large deli orders or whatever in. I also occasionally get Papa Murphy's deep dish pizza, so I wind up with a container like the one shown in these photos. The foil that makes up these containers is thinner than soda can foil, but thicker than 'heavy-duty' aluminum foil. So it is easier to cut and crimp than soda can stock, but it holds its shape reasonably well once it's been crimped. 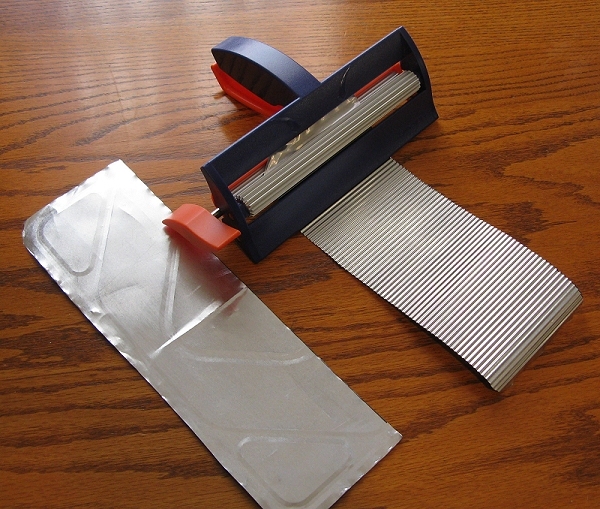 I cut away the sides, which are too wrinkled to use, and cut the bottom into strips that easily fit into the crimper. I feed each piece through most of the way, backed it out and run it through again, just to be certain it's crimped as much as possible. I don't really know if running it through twice is as important with this material as it is with soda cans, but it "couldn't hurt." 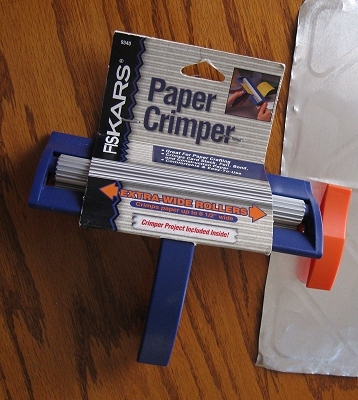 The result is very effective, and the crimping seems strong enough to withstand damage from regular handling. 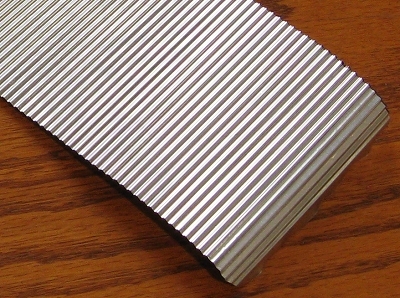 At first I wondered if the pattern that was already pressed into the aluminum would show. It seems to have accepted the crimping just fine, but it is a slightly different color than the rest. The difference is so faint that it doesn't show in the photographs, and any kind of painting would probably hide it completely. This is the latest in a series of money-saving suggestions I've researched for the sake of folks who are trying to build a railroad on a tight budget. I haven't had a chance to build anything with this material yet, but I wanted to get the idea "out there" in case any of our readers might find it useful for their winter projects. 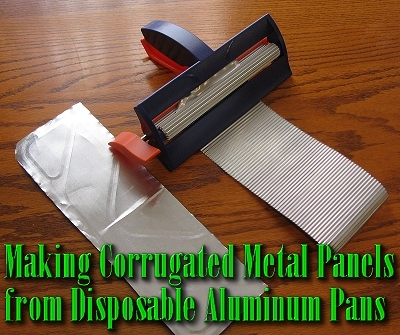 As soon as I finished this article, I went back to George's article to check on something and discovered that he has recently done a structure using aluminum from a disposable pan, too. Now that I know how well this works, I'll be more careful about saving these pans when I come across them. 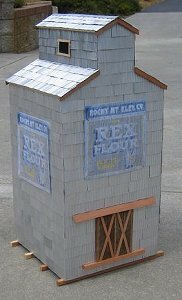 George has built several structures using recycled, crimped aluminum, however, so his pages should give you some ideas of what is possible. If you have any interesting or money-saving structure tips or projects you'd like to share with our fellow readers, please contact me with the details, and I'll be glad to post them, giving you full credit, of course. 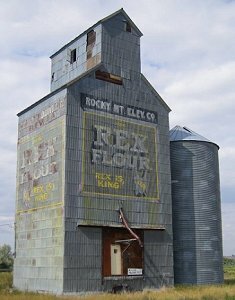 Reader Deane Dvoracek used soda cans and went through two Fiskar crimpers to get enough crimped aluminum to build a 28"-tall model of a real grain elevator he photographed on vacation in Montana. He says his hands are sore, but the results are worth it. I agree.